An internal review shows aides to President-elect Barack Obama had no "inappropriate discussions" with Illinois Gov. Rod Blagojevich or his staff concerning the search for a Senate replacement from Illinois, a spokesman for the presidential transition office said Monday. But spokesman Dan Pfeiffer also said the office won't release details of its review until the week of Dec. 22 at the request of prosecutors "in order not to impede their investigation of the governor." That's Christmas week, when few people will be paying attention and when Obama plans to be celebrating the holiday in Hawaii. 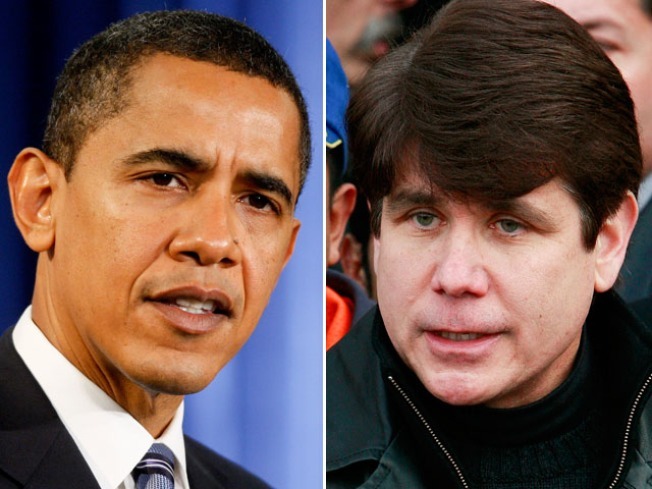 At a news conference Monday afternoon, Obama reiterated that Blagojevich's scandal has nothing to do with him. "This appalling set of circumstances that we have seen arise had nothing to do with my office," Obama said. "Those facts will be forthcoming to all of you in due course. We just want to make sure we're not interfering with an ongoing and active investigation." The brief statement left several issues uncovered. It did not say whether Obama's incoming White House chief of staff, Rep. Rahm Emanuel, was heard on a wiretap providing the governor's top aide with a list of names that the president-elect favored. Nor did it say who if anyone on Obama transition's team had made contact with the governor or his aides concerning a replacement for Obama. In the statement, Pfeiffer said that incoming White House counsel Gregory Craig has kept federal prosecutors informed of the internal review "in order to ensure our full cooperation with the investigation" into allegations against the governor. Pfeiffer said the review "affirmed the public statements of the president-elect that he had no contact with the governor or his staff, and that the president-elect's staff was not involved in inappropriate discussions with the governor or his staff over the selection of his successor as U.S. Senator. Obama resigned his Senate seat last month to prepare for taking the oath of office as president. Blagojevich, who has the power to appoint a replacement, was arrested last week on charges he schemed to sell the seat in exchange for money or political favors for himself or his wife.